Last month I got a wonderful gift from Fer, my virtual friend who hosts the blog “Chucrute com Salsicha“. She sent me a cookbook: The Vegetarian Epicure Book Two, written by Anna Thomas. Anna’s family was originally from Poland, but she was born in Germany, and moved to the US as a young child. While in college at film school in UCLA, she wrote a masterpiece of a cookbook, The Vegetarian Epicure, at a time when avoiding meat was not very common. I enjoyed my gift so much that I could not resist getting her most recent book, Love Soup. It will have a special spot in our home, as the first cookbook I bought this year. By exercising considerable restraint, I lasted through the first week of February. I certainly make my readers proud! ;-)Fer’s thoughtful gift arrived at our doorstep on a Thursday. Forty eight hours later, we enjoyed this very delicious souffle. Butter a 2-quart souffle dish and tie a buttered “collar” made of parchment paper if you want (I omitted this step). Melt the butter in a saucepan and stir in the flour. Cook the roux over medium heat for a minute or two, stirring constantly. Then add the hot milk and stir with a whisk as the sauce thickens. When the sauce is smooth, remove it from the heat and whisk in the egg yolks, one by one. Then add the cooked broccoli, the walnuts, the onions, and the cheese. Stir well and season with salt and pepper. In another bowl, add a pinch of cream of tartar to the egg whites and beat them with a clean whisk or beater until they are stiff enough to form peaks. 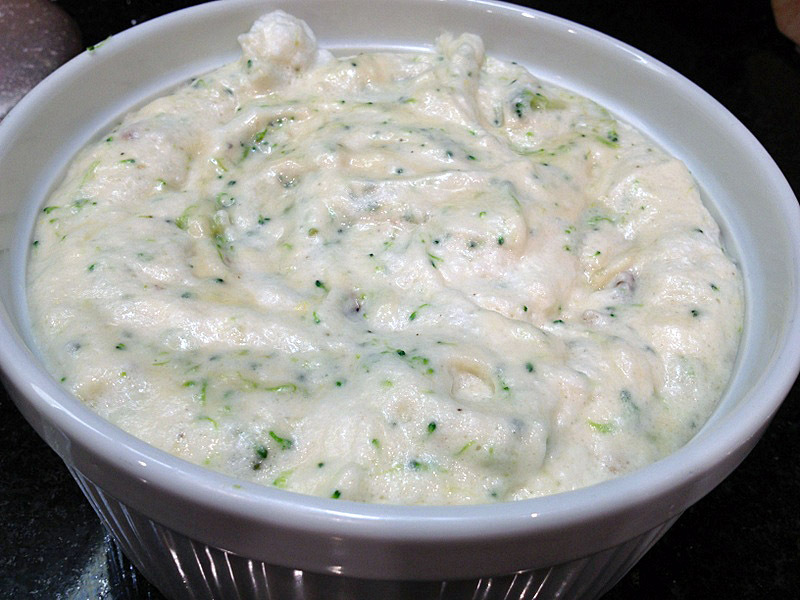 Stir about 1 cup of the beaten egg whites into the warm sauce. Now add the remaining egg whites and gently fold them in, making sure not to lose the air incorporated into it. 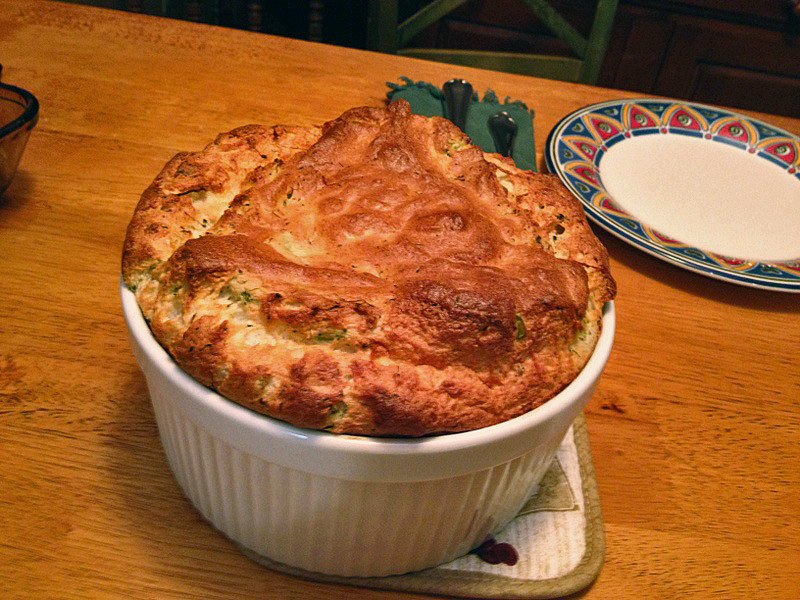 Pile the souffle into the prepared dish, place it in the middle of a 375 F oven, and bake it for 40 to 45 minutes. This version is heartier than your regular cheese souffle, with the broccoli and the nuts. It is satisfying, creamy, and delicious to the last bite! It won’t rise as lightly as a cheese-only, as the eggs need to carry heavier stuff with them. But, what it might lack in airy nature, it compensates with flavor. I think it is wonderful as a full meal, served with a salad and a piece of bread. But, if you absolutely must have some meat with it, a simple roast chicken will do. French home-cooking at its best! ONE YEAR AGO: Voila’ les baguettes!